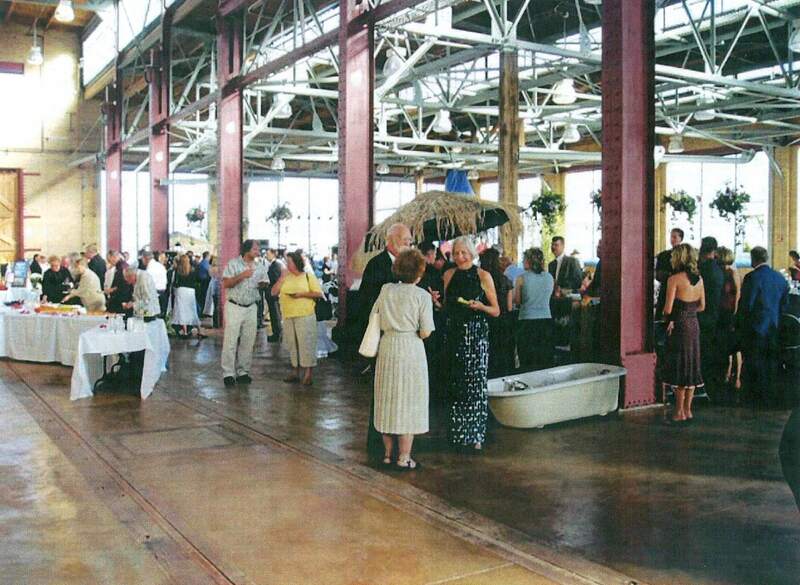 The restored Machine Shop at the historic Evanston Railroad Complex is used for public and private events. Evanston, Wyoming (population 11,507), the "Queen City of the Mountains" nestles in the Bear River Valley, north of the High Uinta Mountains. The Bear River flows through the community, meandering past Bear River State Park where elk and bison roam. Evanston is a gateway for visitors to nearby major attractions including Grand Teton and Yellowstone National Parks. The railroad, ranching, and business all contributed to the growth of Evanston, today a recreation hub. Evanston was incorporated in 1868 as a frontier camp for the construction of the Union Pacific Railroad. Structures that survive date from the 1912-13 construction of a large rail service yard that closed in 1971. The roundhouse, machine shop and nine associated structures were donated to the city in 1972. The city has since worked with the local Historic Preservation Commission, a non-profit corporation, citizen volunteers, and the Urban Renewal Agency to stabilize and restore the structures. Evanston recently completed the restoration of the machine shop, part of the historic Evanston Rail Facility listed in the National Register of Historic Places, and uses it as a community center for public and private events. Evanston's Historic Depot Square is a focal point and gathering place for both residents and visitors. Depot Square is home to Evanston's historic Union Pacific Train Depot, Uinta County Museum, Chinese Joss House Museum, Beeman-Cashin Building, chamber of commerce, Andrew Carnegie Library, and many other significant buildings and structures. According to Ripley, Evanston had more neon lights per capita at one time than any place in the world. Annual heritage observances include the Chinese New Year and a Roundhouse Festival. A highlight each year is the Urban Renewal Ball and Auction that brings the community together to raise funds to rejuvenate the downtown historic district. The redevelopment of the Evanston Train Depot has been one successful outcome. Evanston's preservation efforts also have benefited from Transportation Enhancement and Community Development Block Grants. Evanston helped found Tracks Across Wyoming, a non-profit partnership of Southern Wyoming organizations to promote, preserve, enhance, and interpret the historic transcontinental transportation corridor for the purposes of economic development, education, and the celebration of its heritage. The corridor follows the original route of the transcontinental railroad, and all but one of the major communities along the corridor are railroad towns established when the Union Pacific Railroad progressed through Wyoming from 1867-1868. Historic trails including the Oregon Trail, Overland Trail, Mormon Trail, and Pony Express, cross the TAW corridor. Fossils, stagecoach stops, and railroad depots and roundhouses are just a few examples of the historic resources of the corridor. The corridor also depicts the history of the economy of southern Wyoming featuring seven National Register downtown districts, mining and timber camps, historic ranches, and Chinatowns. The Wyoming State Legislature has designated the Tracks Across Wyoming corridor a State Heritage Corridor. The communities involved in Tracks Across Wyoming are looking to heritage cultural tourism and preservation as a source of economic development. While one community alone cannot effectively protect historic sites and heritage tourism, Tracks Across Wyoming brings communities together to further these goals while creating a regional tourist attraction.